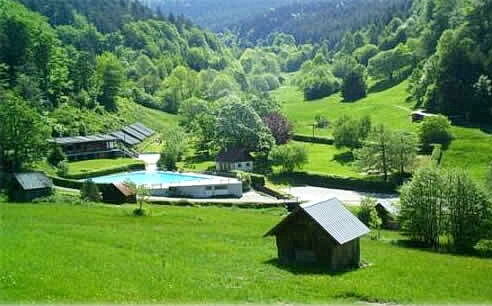 Activities and leisure amenities nearby Campsite Müllerwiese. A sunny playground for children provided with different equipments like seesaw, aswing and table tennis is situated on the car-free tent area. Nearby a small mountain brook invites you to splash around and to make a hydro-therapy in clear spring water. Your obligatory guest card can be used as a free ticket for the public service busses and trains throughout the Black Forest, for example to Bad Wildbad, Calw, Freudenstadt or Pforzheim. The Giant toboggan run at Enzklösterle-Poppeltal, will be an unforgettable adventure. 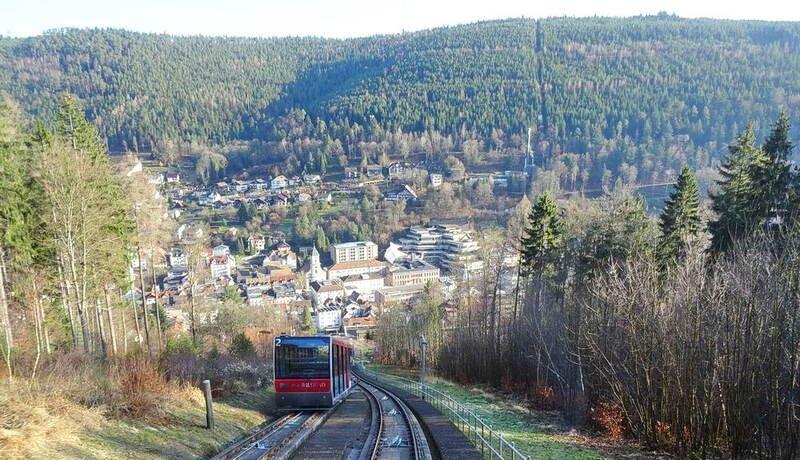 Can you resist one of the longest mountain slides in Germany and the Black Forest, 1500 m long? Children Mini Park. Trampoline, mountain train or pirate ship. 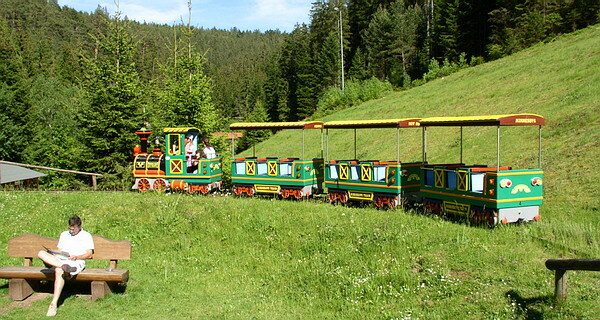 The Mini Park at Enzklösterle-Poppeltal offers an eventful change for your children. Forest Climbing Crag. 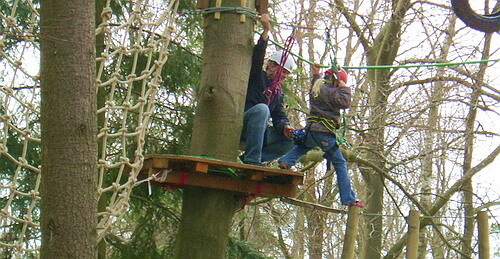 Up to 15 m high climbing paths through the forest, giant swings, zip lines and many other platforms are an adventure for young and old. 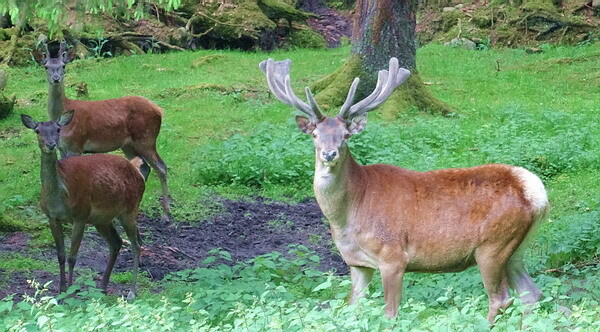 At the Red Deer Park (game enclosure) you can take a closer look at a true Black Forest stag (800 m). On the way there you pass a forest trail, which directs the view through forest windows. At the "Erdbeerplatte" (strawberry plate) you can enjoy the panorama over Enzklösterle from a forest swing. Adventure-Golf Park - The new breathtaking crazy golf course experience. 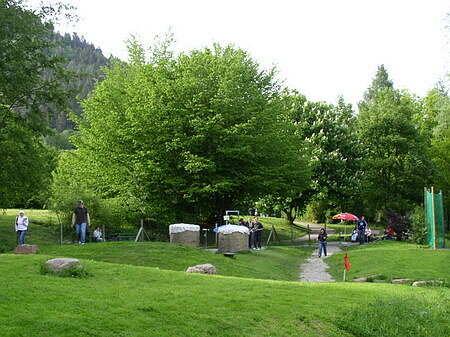 Play on 18 Black Forest typical courses (400 m from the Müllerwiese). Barefoot trail located at the spa gardens of Enzklösterle, is fun especially for the children's feet. The Kneipp-pool (hydrotherapy) is right next to it (300 m). Boccia: balls can be lended free of charge at the tourist information (200 m from the campsite). Open air chessboard in the spa gardens of Enzklösterle (for the pieces ask at the tourist information (200m). Wildbad-Calmbach, Höfen, Altensteig and Reichental (very idyllic in a beautiful Black Forest countryside). Also ideal for swimming, windsurfing and boat trips is the Nagold Reservoir Erzgrube, a 2 km long artificial lake (18 km from the Müllerwiese). On the mount Sommerberg at Bad Wildbad, 12 km from the Müllerwiese there is an exceptional leisure center for all mountainbike fans. Seven downhill tracks with different levels of difficulty wait for you and are within easy reach by cable railway or drag lift. Come and visit the interactive exhibition on the geological and biological specifications of our woods and the Black Forest moorlands. Biological excursions furthermore are offering a lot of interesting features of the nature reserve nearby our resort. 8 km from the campsite. The hiking trails through, round and up the Enz valley are completely new signposted. 350 km you can walk on soft trails through the woods and you can enjoy the peaceful nature with crystal clear water sources, brooks, lakes and untouched moors. We sell hiking maps at our reception office and we offer a hiking information flyer free of charge (see the chapter Brochures. Please visit also the chapter Hiking. At the spa gardens nearby the floaters mock-up (400m from the campsite) there is the starting point of the Jockeles floater trail (distance 23 km). This round tour leads you to the floaters lakes "Poppelsee" and "Kaltenbachsee" (see chapter Hiking). 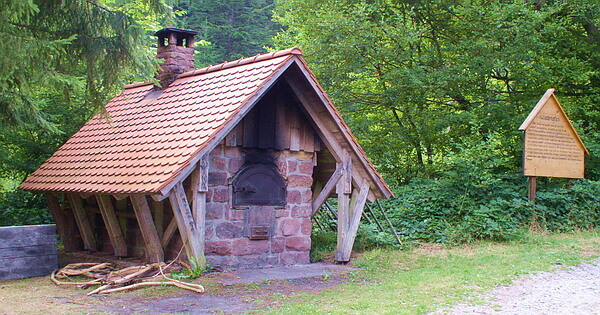 On the way you will pass the forest barbecue area and the so called Wiedeofen in the idyllic Rohnbach valley. A premium hiking trail to the blue gold in the woods leads to the most beautiful places around Enzklösterle. The tour is about 13 km long. Multilingual information boards inform about everything worth knowing about the secrets of the blueberries. Guided walks through our holiday region are regularly offered in the summer half year at Enzklösterle and Bad Wildbad. On the weekly guided cottage tour through the woods during summer season you will get a free hosting with a small meal and beverages. 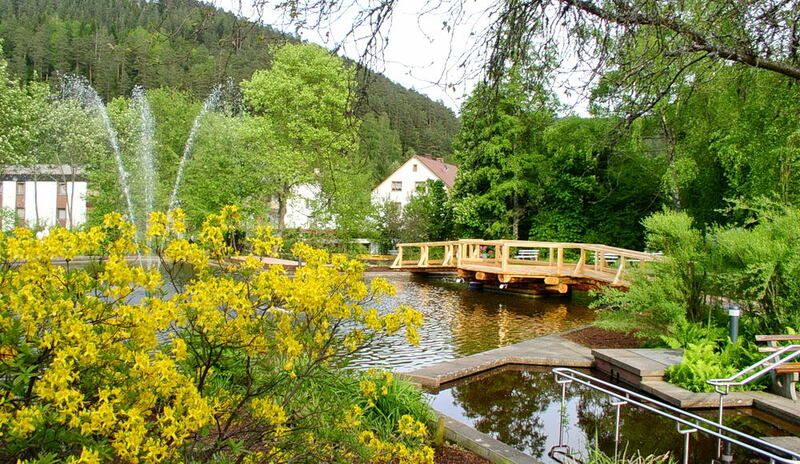 Visiting the Black Forest trouts - walk to the trout farm with the possibility to eat freshly smoked or grilled trouts (2 km, summer season). Soot hut: the stony witness of an extinct profession represents an interesting cultural monument (800 m, open march to october). On three kilometers along a circular nature trail you will reach the most beautiful sites of the forest reserve "Bärlochkar". You will be told about the flora and fauna of the "primeval forest of tomorrow". Learn interesting facts about the geological formation of cirques by glaciers of former ice ages (2 km, see chapter Hiking). Bicycle touring and mountainbiking: Our surroundings have 800 km signposted mountainbike trails which are called the Mountainbike Arena Murg-/Enz valley. Marked circuits with different levels of difficulty are waiting for all nature-loving cyclists (see chapter Cycling). The Enz-valley cycle track leads from Enzklösterle via Pforzheim to Walheim near the mouth into the river Neckar (115 km). Test also the Tälerrunde (valley round tour). On about 120 km parts of the "Enztalradweg" are combined with the "Nagoldtalradweg". Blueberry week and Blueberry Party: In July everything within the Blueberry village Enzklösterle revolves around the blue gold of the forest. Hikes, separate events and a two-day festival around the Black Forest blueberry will delight you. Mushroom and venison weeks: end of September, early October with mushroom courses as well as mushroom and game dishes in the local gastronomy. Krippena: Enjoy the unparalleled permanent exhibition of wood carved christmas cribs with life-sized figures. 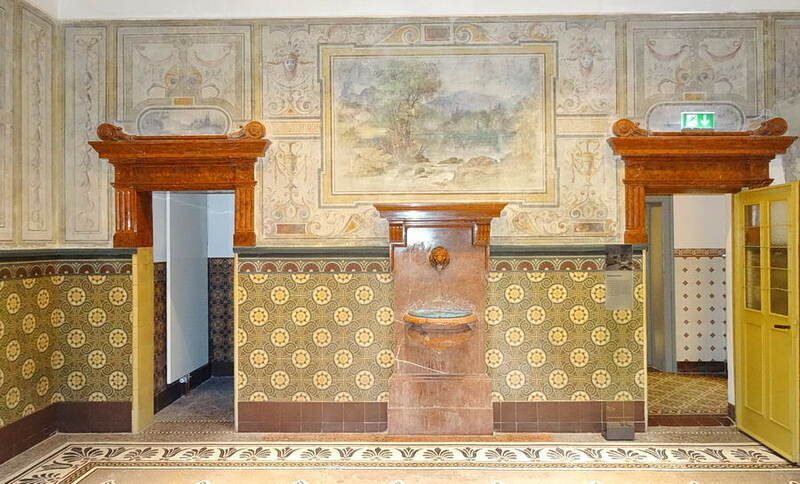 Make also a tour through the Black Forest museum with the representation of historic forest professions (400m). 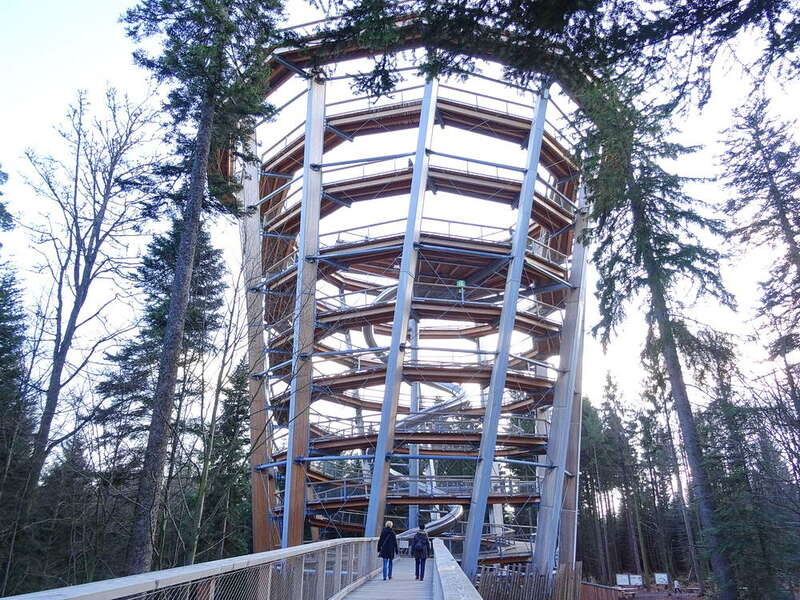 The Treetop Trail at Bad Wildbad (12 km from the Müllerwiese). This spectacular nature attraction on the top of the mountain Sommerberg is easy to reach with the funicular of Bad Wildbad. The more than 1250 m long treetop trail leads through fir forests rich in numerous educational boards and experience points. it finally leads into a 40 m high observation tower. 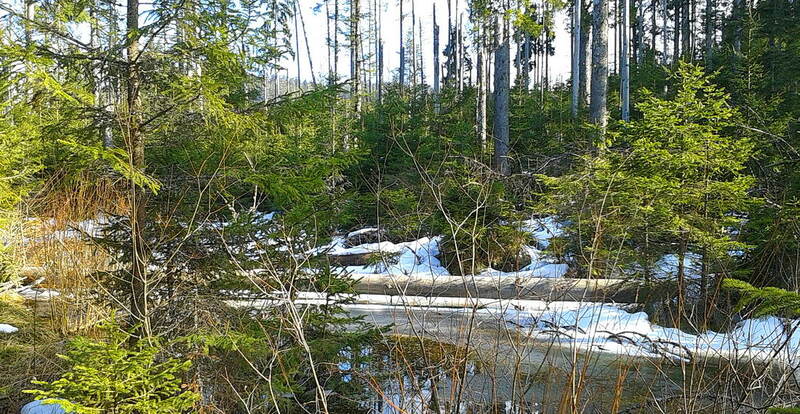 There you have a fantastic view of the woods of the northern Black Forest. A must for all visitors of our region! The visit of the oriental bathing temple Palais Thermal or the thermal bath Vital Therme is a must for all holidaymakers in the Enz valley. Also beautiful is the romantic spa gardens at Bad Wildbad with the historic spa theater, the "Trinkhalle" and the English Church.